An Interview With Kyle Gabhart, Designer of Arctic Scavengers! 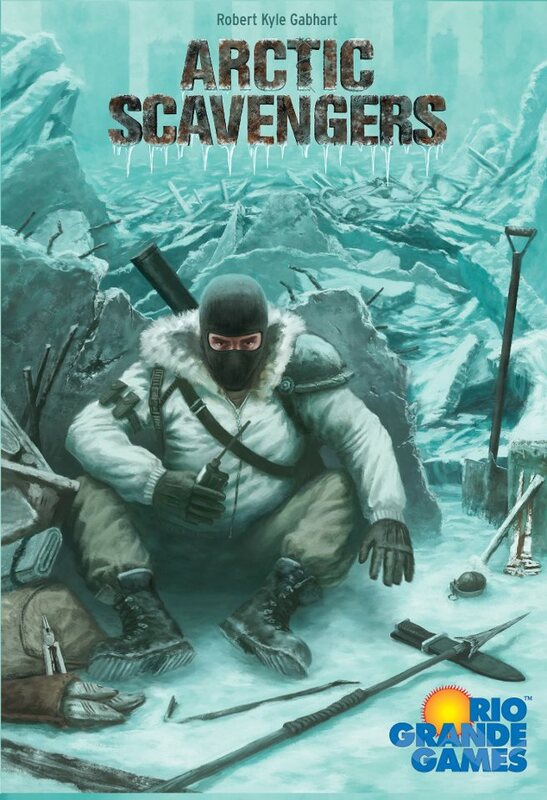 Today’s interview is with Robert K. Gabhart (but he goes by Kyle), designer of Arctic Scavengers—the very first deck-building game to come out after that…other…mildly popular one. We’re super excited he agreed to answer some questions from us. And awaaaaay we go! Well, I’m a Pisces; I enjoy candlelight dinners, and long walks on the beach. You’re from Texas. My (Firestone) wife is, too. Why are you people so stinking obnoxious about being Texans? Never ask a man if he’s from Texas, because if he is, then he’ll come right out and tell you. And if he’s not…well, why embarrass him? The truth is that Texans are a proud bunch because we have just a little bit more awesome inside of us than anyone else seems to have. We have our own electric grid, we are the only state that gets to fly our flag at the same height as the US flag, and we only remain in the union out of pity for the rest of you. 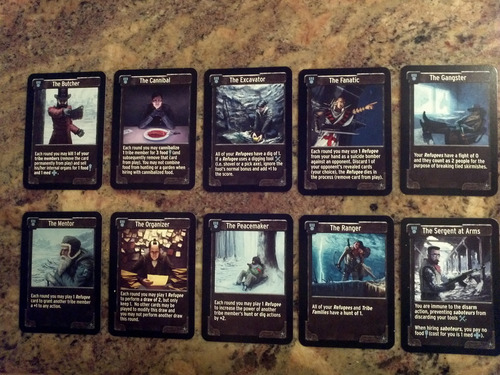 So, Arctic Scavengers: Were you working on a deck-building game before Dominion came out? Or was it designed after you played Dominion? Tell us the design story of Arctic Scavengers. So Dominion was only the 5th designer board game that was even introduced to me. A buddy introduced me to the hobby in November of 2008. 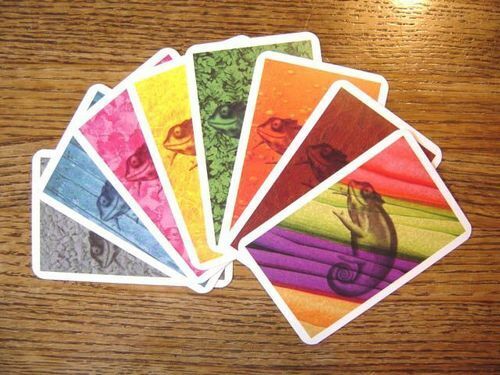 My initial games included: San Juan, Ra, Pandemic, Manila, and Dominion. Dominion particularly piqued my interest. The truth is that the winter of 2008 / 2009 was a very difficult one for me. For years I struggled with chronic, severe back pain and then in December of 2009 I was diagnosed with Ankylosing Spondylitis (AS, a rare form of arthritis that is similar to Rheumatoid Arthritis). That led to a bit of depression and an intense need to pour myself into something. So I poured myself into creating a euro-ish game set in Feudal Japan. That was in January 2009. Then in February, after several games of back-to-back Dominion, it dawned on me that Dominion could really benefit from a more tightly woven theme and more direct player interaction. Starting at 11:00pm one night, I proceeded to work on the core mechanics and structure of Arctic Scavengers (AS) in a marathon design session consisting of pencil and note cards. By 7:00am the next morning I had the bulk of what became the base game. 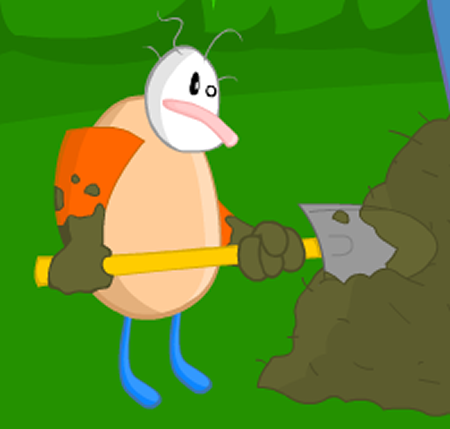 Roughly 70% of what went into the base AS game was designed during that initial night of crazed inspiration. What made you decide to self-publish the 1st edition? I wanted to see the game come to light sooner rather than later and I didn’t have any existing connections in the industry. I looked around at a few publishers and no one really seemed very eager to accept design submissions, so I figured I would just go ahead and do it myself. 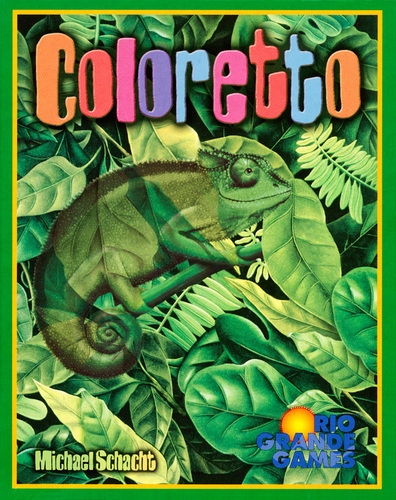 We noticed that the Rio Grande Games version includes the HQ expansion. What does that add to the game? The HQ expansion really opens up the play possibilities. 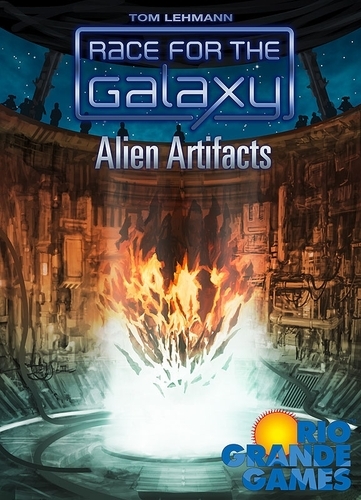 There are Tribal Leaders, which grant unique player powers (The Cannibal eats tribe members for food, The Mentor can use a Refugee to modify any action, and The Organizer has a special draw action), Buildings (Bunker, Hydroponic Garden, Armory, and Pharmacy) that the Engineer mercenary can construct back at your base to enable hand management, A Medic mercenary that enables you to acquire medicine through hunting and serves as a counter to Sniper Team attacks, and there are gangs that bestow end-game points based upon accumulating certain resources. How has your faith affected your journey as a game designer? Interesting question. Game design is a creative activity driven by passion, and it borders on being a spiritual experience for me. I have been blessed with an immense passion for games and with a spark of creativity and wonder. As for the game design journey itself, my faith has helped me to not sweat the small stuff and leave the process of how and when things unfold in the far more capable hands of my Lord and savior. His timing is perfect and his perspective is far broader and more informed than my own. Things will happen when they need to happen, and in a way that is far more awesome than they would if it were all up to me. This awareness frees me from a lot of the stress and anxiety that could potentially exist as a game designer and publisher. Do you have a game group you play with regularly? (Besides your wife and 6(!) kids, of course.) Which recent game has come out of left field and surprised you with how good it is? I try to get over to the Dallas Games Marathon as often as I can. Usually that is once every couple of months. I also have a couple of guys that I collaborate with on game designs. Finally, my wife and I host a game night at our house several times a year. So I wouldn’t say that I have a regular group, but I do find lots of opportunities to play games. That having been said, it is true that I have probably logged more games of Zombie Dice, Martian Dice, San Juan, and Pandemic than most of the designers of those games. These are favorites of my family and so we play them an inordinate amount of time. What are your five favorite games—and what do you love about them? Arctic Scavengers – They put my name on the box!!! So do you have any upcoming designs you can share with us? I have a game that I designed a month BEFORE Arctic Scavengers that is just waiting to see the light of day. 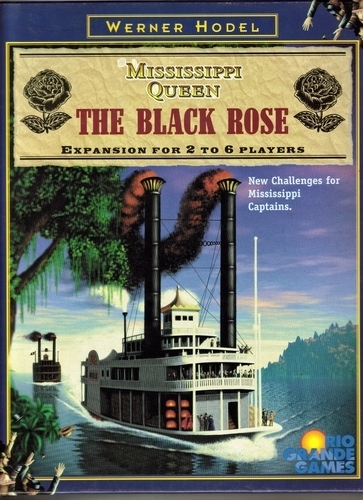 It has a euro-style economic engine and victory point system with an American-style combat system. It’s set in Feudal Japan and manages to fit into the 60-90 minute window. It’s called Kingdoms of Rice, has absolutely STUNNING artwork, and will be Kickstarted (Lord willing) this summer. Favorite Dr. Who episode? When? Thanks so much, Kyle! 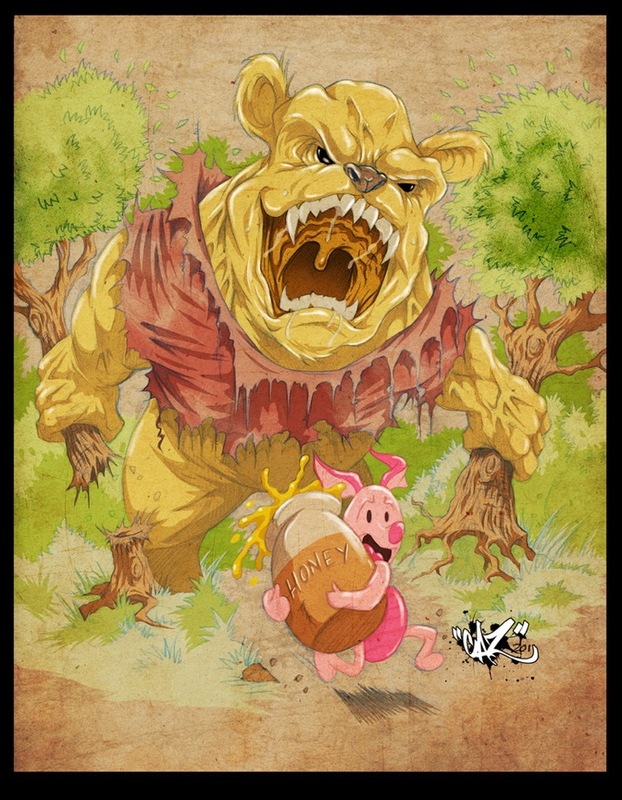 Go check out his game—it’s a solid addition to the deck-building genre! Thanks for reading! And make sure you check us out on Twitter, Facebook, and now Instagram! 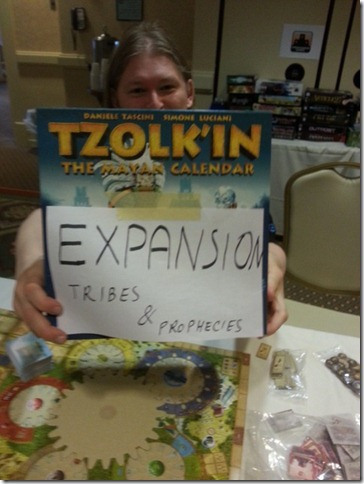 Tzolk’in is Gett’in an Expans’ion! My (Firestone) favorite game of last year was Tzolk’in—a fascinating worker-placement game with a cool set of gears in the middle of the board. You can read my review right here. Well, a report out of The Gathering of Friends—an exclusive, invitation-only week of boardgaming in New York—has revealed that there’s an expansion in the works. I can’t wait!! Get your copy of Tzolk’in on Amazon here. S—To be honest, most of that was on Jared. He pushed for getting it published, and so I’ll let him tell the tale. So many to choose from! Probably the most recent great memory was the ferocious dinosaur-beast known as Winnie the Pooh… Other classics include the inability for anyone to remember Mr. E. Lee’s first name, Buzz Lightyear the Nazi, and of course Maya Angelou the fighter plane. Thanks to Jared and Shane for answering our questions! And go check out the Kickstarter campaign! There’s less than a week to go; trust me: This is a really fun game.